The summer transfer window is open and will close at 11pm BST 31 August. Find below all signings made by the 2017/18 season’s clubs. This list is correct as of 20:22 BST, Wednesday 23 August. The summer transfer window began once clubs had concluded their final domestic fixture of the 2016–17 season, but many transfers will only officially go through on 1 July because the majority of player contracts finish on 30 June. The window will remain open until 18:00 BST on 1 September 2017. The window shuts at 18:00 BST this time due to the UEFA player registration deadlines for both the Champions League and Europa League ending at 23:00 BST, giving the 6 sides still in Europe time to conclude deals and register their player for continental matches if appropriate. INS: Sead Kolasinac (free, Schalke), Alexandre Lacazette (£46.4m, Lyon). OUTS: Chris Willock (free, Benfica), Stefan O’Connor (free, Newcastle), Yaya Sanogo (free, Toulouse), Kaylen Hinds (undisclosed, Wolfsburg), Glen Kamara (free, Dundee), Marc Bola (loan, Bristol Rovers), Wojciech Szczesny (£10m, Juventus), Damian Martinez (loan, Getafe), Stephy Mavididi (loan, Preston), Gabriel (£10m, Valencia), Carl Jenkinson, Cohen Bramall (both loan, both Birmingham), Ismael Bennacer (undisclosed, Empoli), Savvas Mourgos (undisclosed, Norwich), Kristopher da Graca and Kostas Pileas (both released). INS: Asmir Begovic (£10m, Chelsea), Jermain Defoe (free, Sunderland), Nathan Ake (£20m, Chelsea), Connor Mahoney (free, Blackburn). OUTS: Mark Travers (loan, Weymouth), Harry Cornick (undisclosed, Luton), Ryan Allsop (loan, Blackpool), Lewis Grabban (loan, Sunderland), Ben Whitfield (loan, Port Vale), Sam Matthews (loan, Eastleigh), Max Gradel (loan, Toulouse), Jordan Green (free, Yeovil), Baily Cargill (loan, Fleetwood), Matthew Neale, Jake McCarthy and Callum Buckley (all released). INS: Pascal Gross (£2.55m, Ingolstadt), Josh Kerr (undisclosed, Celtic), Mathew Ryan (£5m, Valencia), Markus Suttner (£3.8m, FC Ingolstadt), Mathias Normann (undisclosed, FK Bodo/Glimt), Izzy Brown (loan, Chelsea), Davy Propper (£10m, PSV), Soufyan Ahannach (undisclosed, Almere City), Jose Izquierdo (£13.5m, Club Brugge). OUTS: David Stockdale (free, Birmingham), Chris O’Grady (free, Chesterfield), Elvis Manu (free, Genclerbirligi SK), Jordan Maguire-Drew (loan, Lincoln), Christian Walton (loan, Wigan), Rob Hunt (undisclosed, Oldham), Oliver Norwood (loan, Fulham), Vegard Forren (free, Molde), Tom Dallison (loan, Accrington), Tyler Forbes (loan, Accrington), Kazenga LuaLua (loan, QPR). INS: Charlie Taylor (Compensation, Leeds), Jon Walters (£3m, Stoke), Jack Cork (£10m, Swansea), Phil Bardsley (£750,000, Stoke), Adam Legzdins (undisclosed, Birmingham), Chris Wood (£15m, Leeds United). OUTS: Michael Keane (£25m, Everton), Andre Gray (£18.5m, Watford), George Boyd (free, Sheffield Wednesday), Josh Ginnelly (loan, Lincoln), Michael Kightly (free, Southend), Tendayi Darikwa (undisclosed, Nottingham Forest), Chris Long (loan, Northampton), Alex Whitmore (loan, Bury), Aiden O’Neill (loan, Fleetwood), Conor Mitchell (loan, Chester), Luke Hendrie (loan, Bradford), Joey Barton, George Green, RJ Pingling, Christian Hill and Taofiq Olmowewe (all released). INS: Willy Caballero (free, Manchester City), Ethan Ampadu (Compensation, Exeter), Antonio Rudiger (£33.3m, Roma), Tiemoue Bakayoko (£39.7m, Monaco), Alvaro Morata (£58m, Real Madrid). OUTS: Juan Cuadrado (£17m, Juventus), Christian Atsu (£6.2m, Newcastle), Dominic Solanke (Compensation, Liverpool), Asmir Begovic (£10m, Bournemouth), Alex Kiwomya (free, Doncaster), Bertrand Traore (£8.8m, Lyon), Nathan Ake (£20m, Bournemouth), John Terry (free, Aston Villa), Tammy Abraham (loan, Swansea), Kasey Palmer (loan, Huddersfield), Todd Kane (loan, Groningen), Charlie Colkett (loan, Vitesse), Bradley Collins (loan, Forest Green), Ola Aina (loan, Hull), Ruben Loftus-Cheek (loan, Crystal Palace), Nathaniel Chalobah (£5m, Watford), Lucas Piazon (loan, Fulham), Marco van Ginkel (loan, PSV), Ike Ugbo (loan, Barnsley), Jay Dasilva (loan, Charlton), Kurt Zouma (loan, Stoke), Mason Mount (loan, Vitesse), Izzy Brown (loan, Brighton), Tomas Kalas (loan, Fulham), Michael Hector (loan, Hull), Jamal Blackman (loan, Sheffield United), Matt Miazga (loan, Vitesse), Nemanja Matic (£40m, Manchester United), Mario Pasalic (loan, Spartak Moscow), Victorien Angban (loan, Beveren), Lewis Baker (loan, Middlesbrough), Fankaty Dabo (loan, Vitesse), Alex Davey (released). INS: Ruben Loftus-Cheek (loan, Chelsea), Jairo Riedewald (£8m, Ajax), Timothy Fosu-Mensah (loan, Manchester United). OUTS: Kwesi Appiah (free, Wimbledon), Ben Wynter (free, Bromley), Luke Croll (free, Exeter), Ezekiel Fryers (free, Barnsley), Steve Mandanda (undisclosed, Marseille), Fraizer Campbell (free, Hull), Corie Andrews, Jonathan Benteke, Mathieu Flamini, Ryan King-Elliott, Joe Ledley and Randell Williams (all released). INS: Jordan Pickford (£25m, Sunderland), Davy Klaassen (£23.6m, Ajax), Henry Onyekuru (£7m, Eupen), Sandro Ramirez (£5m, Malaga), Michael Keane (£25m, Burnley), Anton Donkor (loan, Wolfsburg), Josh Bowler (£4m, QPR), Wayne Rooney (free, Manchester United), Cuco Martina (free, Southampton), Lewis Gibson (£6m, Newcastle), Gylfi Sigurdsson (£45m, Swansea). OUTS: Tom Cleverley (£8m, Watford), Henry Onyekuru (loan, Anderlecht), Russell Griffiths (free, Motherwell), Delial Brewster (free, Chesterfield), Conor McAleny (free, Fleetwood), Gerard Deulofeu (£10.5m, Barcelona), Brendan Galloway (loan, Sunderland), Josef Yarney (free, Newcastle), Tyias Browning (loan, Sunderland), Romelu Lukaku (£75m, Manchester United), Aiden McGeady (£250,000, Sunderland), Arouna Kone (free, Sivasspor), Matthew Pennington (loan, Leeds United), Kieran Dowell (loan, Nottingham Forest), Courtney Duffus (undisclosed, Oldham), Joe Williams (loan, Barnsley), Antonee Robinson (loan, Bolton), Leandro Rodriguez (free, Danubio), Gareth Barry (£1m, West Brom), Jack Bainbridge, Michael Donohue, Tyrone Duffus, Connor Hunt and James Yates (all released). INS: Elias Kachunga (£1.1m, Ingolstadt), Laurent Depoitre (£3.5m, Porto), Aaron Mooy (£10m, Manchester City), Jonas Lossl (loan, Mainz), Tom Ince (Derby, £8.5m), Kasey Palmer (loan, Chelsea), Danny Williams (free, Reading), Steve Mounie (£11.5m, Montpellier), Scott Malone (£5m, Fulham), Mathias Jorgensen (£3.5m, FC Copenhagen), Abdelhamid Sabiri (undisclosed, Nurnberg). OUTS: Joe Murphy (free, Bury), Jordy Hiwula (free, Fleetwood), Tareiq Holmes-Dennis (loan, Portsmouth), Fraser Horsfall (loan, Gateshead), Rekeil Pyke (loan, Port Vale), Jack Payne (loan, Oxford), Harry Bunn (undisclosed, Bury), Luke Coddington (free, Northampton), Sean Scannell (loan, Burton), Flo Bojaj (released). INS: Kelechi Iheanacho (£25m, Man City), Harry Maguire (£17m, Hull), Vicente Iborra (£12m, Sevilla), Eldin Jakupovic (£2m, Hull), George Thomas (£500,000, Coventry City). OUTS: Ron-Robert Zieler (£3m, Stuttgart), Bartosz Kapustka (loan, Freiburg), Callum Elder (loan, Wigan), Harvey Barnes (loan, Barnsley), Tom Lawrence (£5m, Derby), Michael Cain, David Domej, Brandon Fox, Cedric Kipre, Matthew Miles, Kairo Mitchell and Marcin Wasilewski (all released). INS: Dominic Solanke (compensation, Chelsea), Mohamed Salah (£34.3m, Roma), Andrew Robertson (£8m, Hull). OUTS: Andre Wisdom (£4.5m, Derby) Tom Brewitt (free, Middlesbrough), Madjer Gomes (free, Leeds), Ryan Fulton (free, Hamilton), Lucas Leiva (£5m, Lazio), Kevin Stewart (£8m, Hull), Pedro Chirivella (loan, Willem II), Adam Phillips (loan, Norwich), Connor Randall (loan, Hearts), Taiwo Awoniyi (loan, Mouscron), Shamal George (loan, Carlisle), Sheyi Ojo (loan, Fulham), Jake Brimmer, Jack Dunn, Kane Lewis, Alex Manninger (all released). INS: Bernardo Silva (£43m, Monaco), Ederson (£34.9m, Benfica), Kyle Walker (£51m, Tottenham), Douglas Luiz (£10.7m, Vasco Da Gama), Danilo (£26.5m, Real Madrid), Benjamin Mendy (£52m, Monaco), Olarenwaju Kayode (£3.5m, Austria Vienna). OUTS: Kelechi Iheanacho (£25m, Leicester), Pablo Zabaleta (free, West Ham), Angus Gunn (loan, Norwich City), Aaron Mooy (£10m, Huddersfield), Willy Caballero (free, Chelsea), Ashley Smith-Brown (loan, Hearts), Bersant Celina (loan, Ipswich Town), Ruben Sobrino (£1.7m, Alaves), Joe Coveney (free, Nottingham Forest), Bruno Zuculini (undisclosed, Verona), Olivier Ntcham (£4.5m, Celtic), Nolito (£7.9m, Sevilla), Joe Hart (loan, West Ham), Gael Clichy (free, Istanbul Basaksehir), Aleksandar Kolarov (£4.5m, Roma), Jesus Navas (free, Sevilla), Ellis Plummer (free, Motherwell), Rodney Kongolo (loan, Doncaster Rovers), Douglas Luiz, Marlos Moreno, Pablo Maffeo and Aleix Garcia, Olarenwaju Kayode (all loan, Girona), Anthony Caceres (loan, Al-Wasl), Fernando (£4.75m, Galatasaray), Zackarias Faour (undisclosed, IK Sirius), Uriel Antuna (loan, Groningen), Samir Nasri (£3.2m, Antalyaspor), Bacary Sagna, Callum Bullock and Billy O’Brien (all released). INS: Victor Lindelof (£30.75m, Benfica), Romelu Lukaku (£75m, Everton), Nemanja Matic (£40m, Chelsea). OUTS: Josh Harrop (free, Preston), Regan Poole (loan, Northampton), Wayne Rooney (free, Everton), Dean Henderson (loan, Shrewsbury), Adnan Januzaj (£8m, Real Sociedad), Sam Johnstone (loan, Aston Villa), Devonte Redmond (loan, Scunthorpe), Zlatan Ibrahimovic (released), Cameron Borthwick-Jackson (loan, Leeds), Timothy Fosu-Mensah (loan, Crystal Palace), Guillermo Varela (undisclosed, Penarol). INS: Christian Atsu (£6.2m, Chelsea), Florian Lejeune (£8.7m, Eibar), Stefan O’Connor (free, Arsenal), Josef Yarney (free, Everton), Jacob Murphy (£12m, Norwich), Javier Manquillo (undisclosed, Atletico Madrid), Mikel Merino (loan, Borussia Dortmund), Joselu (£5m, Stoke). OUTS: Matz Sels (loan, Anderlecht), Kevin Mbabu (undisclosed, BSC Young Boys), Vurnon Anita (free, Leeds), Alex Gilliead (loan, Bradford), Tom Heardman (loan, Bury), Sammy Ameobi (free, Bolton), Adam Armstrong (loan, Bolton), Yoan Gouffran (free, Goztepe SK), Daryl Murphy (£2m, Nottingham Forest), Sean Longstaff (loan, Blackpool), Lewis Gibson (£6m, Everton), Ivan Toney (loan, Wigan), Callum Williams (loan, Gateshead). INS: Jan Bednarek (£5m, Lech Poznan), Mario Lemina (£15.4m, Juventus), Wesley Hoedt (£15.5m, Lazio). OUTS: Jay Rodriguez (£12m, West Brom), Lloyd Isgrove (free, Barnsley), Jason McCarthy (undisclosed, Barnsley), Harrison Reed (loan, Norwich), Olufela Olomola (loan, Yeovil), Cuco Martina (free, Everton), Ryan Seager (loan, MK Dons), Sam Gallagher (loan, Birmingham), Paulo Gazzaniga (undisclosed, Tottenham), Lloyd Isgrove, Harley Willard and Martin Caceres (all released). INS: Darren Fletcher (free, West Brom), Josh Tymon (undisclosed, Hull), Kurt Zouma (loan, Chelsea), Eric Maxim Choupo-Moting (free, Schalke), Bruno Martins Indi (£7m, Porto), Jese Rodriguez (loan, PSG). OUTS: Jon Walters (£3m, Burnley), Daniel Bachmann (free, Watford), Glenn Whelan (£1.25m, Aston Villa), Marko Arnautovic (£20m, West Ham), Phil Bardsley (£700,000, Burnley), Ryan Sweeney (loan, Bristol Rovers), Dominic Telford (loan, Bristol Rovers), Marc Muniesa (loan, Girona), Joselu (£5m, Newcastle), Moha El Ouriachi (loan, Espanyol), Shay Given, Liam Edwards, Harry Isted, Joel Taylor and George Waring (all released). INS: Erwin Mulder (free, Heerenveen), Tammy Abraham (loan, Chelsea), Roque Mesa (£11m, Las Palmas), Sam Clucas (£15m, Hull). OUTS: Modou Barrow (£1.5m, Reading), Alex Samuel (free, Stevenage), Bafetimbi Gomis (£2.1m, Galatasaray), Josh Vickers (free, Lincoln), Liam Edwards (free, Hull), Daniel James (loan, Shrewsbury), Borja Baston (loan, Malaga), Jordi Amat (loan, Real Betis), Liam Shephard (free, Peterborough), Jack Cork (£10m, Burnley), Keston Davies (Yeovil, loan), Connor Roberts (loan, Middlesbrough), Franck Tabanou (free, Guingamp), Gylfi Sigurdsson (£45m, Everton), Matt Grimes (loan, Northampton), Stephen Kingsley (undisclosed, Hull), Gerhard Tremmel, Marvin Emnes, Owain Jones, Tom Dyson and Tom Holland (all released). INS: Davinson Sanchez (£28m, Ajax), Paulo Gazzaniga (undisclosed, Southampton). OUTS: Filip Lesniak (free, Aalborg BK), Connor Ogilvie (loan, Gillingham), Luke McGee (undisclosed, Portsmouth), Kyle Walker (£51m, Manchester City), Federico Fazio (Roma, £2.6m), Clinton N’Jie (£6m, Marseille), Josh Onomah (loan, Aston Villa), Tom McDermott, Joe Muscatt, Charlie Owens and Zenon Stylianides (all released). 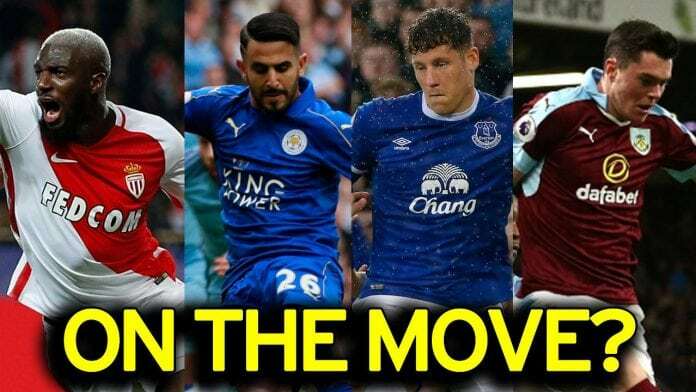 INS: Andre Gray (£18.5m, Burnley), Tom Cleverley (£8m, Everton), Will Hughes (£8m, Derby), Daniel Bachmann (free, Stoke), Kiko Femenia (free, Alaves), Harvey Bradbury (free, Portsmouth), Sam Howes (free, West Ham), Nathaniel Chalobah (£5m, Chelsea), Richarlison (£13m, Fluminense). OUTS: Rene Gilmartin (free, Colchester), Dennon Lewis (loan, Crawley), Mario Suarez (undisclosed, Guizhou Hengfeng Zhicheng), Steven Berghuis (£5.5m, Feyenoord), Juan Carlos Paredes (free, Emelec), Obbi Oulare (loan, Royal Antwerp), Giedrius Arlauskis (free, Cluj), Valon Behrami (undisclosed, Udinese), Mathias Ranegie, Ola Adeyemo, Charlie Bannister, Ogo Obi, Juanfran and Rhyle Ovenden (all released). INS: Jay Rodriguez (£12m, Southampton), Yuning Zhang (undisclosed, Vitesse Arnhem), Ahmed Hegazi (loan, Al Ahly), Gareth Barry (£1m, Everton). OUTS: Craig Gardner (undisclosed, Birmingham), Darren Fletcher (free, Stoke), Yuning Zhang (loan, Werder Bremen), Shaun Donnellan (loan, Walsall), Kyle Howkins (loan, Cambridge), Daniel Barbir, Zachary Elbouzedi, Callam Jones, Sebastien Pocognoli, Jack Rose and Andre Wright (all released). INS: Pablo Zabaleta (free, Manchester City), Joe Hart (loan, Manchester City), Marko Arnautovic (£20m, Stoke City), Javier Hernandez (£16m, Bayer Leverkusen), Sead Hakšabanović (£2.7m, Halmstads BK). OUTS: Stephen Hendrie (free, Southend), Reece Oxford (loan, Borussia Monchengladbach), Alvaro Arbeloa (retired), Sam Howes (free, Watford), Enner Valencia (£5m, Tigres), George Dobson (undisclosed, Sparta Rotterdam), Darren Randolph (£5m, Middlesbrough), Jack Fitzwater (loan, Forest Green), Ashley Fletcher (£6.5m, Middlesbrough), Reece Burke (loan, Bolton), Josh Cullen (loan, Bolton), Kyle Knoyle (free, Swindon), Sofiane Feghouli (£5m, Galatasaray), Sam Ford and Sam Westley (all released).